The Digital Research Library of Illinois History Journal™: The Snow and Ice Railway on the Midway Plaisance at Chicago's 1893 World's Fair. The Snow and Ice Railway on the Midway Plaisance at Chicago's 1893 World's Fair. 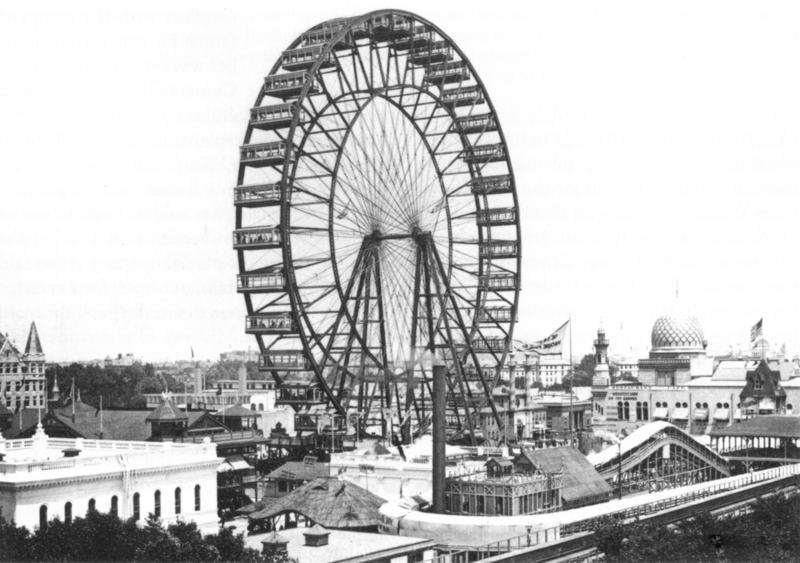 In historical accounts of the World's Columbian Exposition, the story of the Ferris wheel has eclipsed that of another unusual mechanical and quite successful Midway attraction: Thomas Rankin's Snow and Ice Railway. Essentially a roller coaster running on an ice paved track, it was among the earliest coasters constructed in the United States. It was built on a tract of land 60 by 400 feet upon the southern portion of the Midway Plaisance near Lexington Avenue (later renamed South University Avenue) and consisted of a loop with one high point of elevation at twenty-five feet. The ice was manufactured by machinery on site. There were two trains, each of which was made up of four connected bobsleds with six seats apiece. The trains would be drawn to the high point by a cable, then freed and allowed to slide down the inclines and around the loop. The track width was 44.5 inches and fitted on both sides with rubber wheels, insuring a smooth, steady ride. The entrance and exit platform also included a restaurant. 10¢ for two consecutive trips. The concession was granted to J.C. De La Vergue and T. L. Rankin. The application was originally made to use it as a means of transportation from the south end of Horticultural building to the north end of the Liberal Arts building, the railway passing over the Wooded Island and the East Lagoon. Drawings were submitted showing beautiful wire rope suspension bridges located eighty feet apart, making each way a trip, loading and unloading at either end. There having been no bridge within one-quarter of a mile of this point on the East Lagoon, there is no doubt that the Fair Company and the projectors would have both done well financially had the concession been let-in that form, especially considering that in the location the concession actually had, nineteen thousand people rode on the railway in a single day, and yet the main structure of the concession was hidden from view by other buildings erected immediately in front of it. The Snow and Ice Railway can be seen in the Foreground. The Ice Railway was built under patents belonging to Thomas L. Rankin, of Sacketts Harbor, New York, who received the same Bronze St. Gaudens Medal and the diploma awarded by the Exposition for all contest participants who reached an 80% score or higher in their category. At the close of the Exposition, the Snow and Ice Railway was moved to Coney Island in Brooklyn but direct sunlight and insufficient refrigeration quickly closed the ride. As Robert Cartwell wrote in his book, The Incredible Scream Machine: A History of the Roller Coaster, "It was not the first idea to be duplicated from Chicago at Coney Island. It would seem that if certain entrepreneurs had their way, the complete Midway Plaisance would have been moved to Brooklyn." 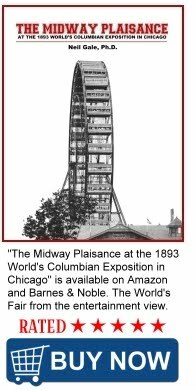 This is but one example of the influence the 1893 Columbian Exposition had on future expositions, amusement parks and American cultural life, generally.